Karan Johar just shared the first song of his period film, Kalank and we can't get enough of the beautiful setting and the beautiful ladies. Kalank stars Bollywood biggies like Varun Dhawan, Aditya Roy Kapur, Sonakshi Sinha, Alia Bhatt, Madhuri Dixit and Sanjay Dutt. 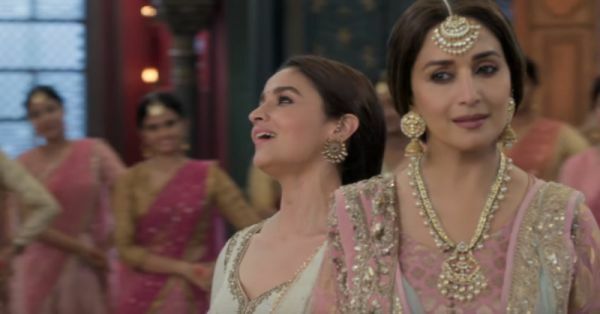 The first song of the film, Ghar More Pardesiya focuses on how Alia Bhatt and Madhuri Dixit meet and connect instantly. Clad in gorgeous outfits, the two ladies can be seen sharing a jugal bandi on-screen, with Madhuri playing the role of a dance teacher while singing the track. While the trailer and this song suggest otherwise, the latest poster of Kalank calls Alia Bhatt aka Roop the 'feisty' one known for her courage. Madhuri Dixit aka Bahaar Begum is described as a dancer who 'moves like the wind and her voice flows like a river,' and this song proves just that. The film is all set to hit the theatres on 17th April and this song has us counting down the days. There was a sense of Deja Vu that hit us the first time we saw this song and I think we'll finally figure out the reason! Syncronised dance-offs seem to follow Madhuri Dixit into movies that she does. Here are other songs in which Madhuri shared the dance floor with some notable actresses. In Devdas, Madhuri Dixit and Aishwarya Rai Bachchan looked beautiful in matching Bengali saris and swirled in perfect rhythm. Aptly named, The Dance Of Envy saw these two brilliant dancers at the peak of their careers setting fire to the stage, in this contemporary number. Karisma Kapoor and Madhuri Dixit's chemistry in this superhit Yash Raj film is what makes this movie a crowd favourite, 22 years after its release. This super hit song was the commercial hook this movie needed as it spoke about the various social issues women fight against every day. Manisha Koirala and Madhuri Dixit, both brilliant dancers turned an otherwise average song into a delightful watch with their grace and elegance.